WhatsApp is a cross-platform instant messaging service for mobile devices that relies on the internet for the transmission of messages. As of January 2017, the mobile messenger has more than 1.2 billion monthly active users worldwide and ranks as one of the most popular social platforms globally. Based on a low-cost subscription model, WhatsApp is a cheap alternative to carrier-billed text messaging via SMS, especially for international or group messaging. The mobile messaging app enables users to share text, image, video, voice messages and also supports video calling. The service handles more than 1.6 billion photo and messages per day. WhatsApp might be the market leader in terms of global audiences but as of January 2017, the messaging app faces strong competition from Asia-based social messenger apps such as WeChat, LINE or Kakaotalk. 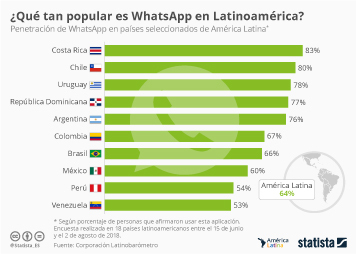 Despite the app's strong global presence, WhatsApp is not so dominant in the United States. In February 2017, WhatsApp ranked behind Facebook Messenger, Google Hangouts and Snapchat in terms of U.S. mobile audience reach. In February 2017, only 39 percent of the population in the United States were aware of the mobile messenger. The number of WhatsApp users in the United States is projected to reach 25.6 million in 2021. As of the third quarter of 2016, the share of global active WhatsApp users accessing the app several times per day was 58 percent. In February 2014, social network Facebook acquired WhatsApp for 19 billion U.S. dollars. Facebook CEO Mark Zuckerberg stated that Facebook's acquisition of WhatsApp was closely related to the Internet.org vision of more affordable and efficient internet access worldwide. Facebook's own Messenger app reported a global audience base of 1 billion monthly active users in July 2016. Due to his profits from the Facebook acquisition, WhatsApp founder Jan Koum currently ranks third among social media billionaires worldwide with an estimated personal net worth 9 billion U.S. dollars as of March 2017.